Sitting on the front porch always brings a smile to your face. Not only because you are cooler and protected from the harmful UV rays of the sun, but also because it reminds you of your childhood and the many summer afternoons you came up the street, walking back from summer camp programs and saw your mother sitting on the front porch, under the awning waiting for you. She didn’t have a glass of cold lemonade or milk and cookies, but there was a reason for that. Any minute, with just enough time for a hug and a hand wash, the ice cream truck would be coming around the corner, bells jingling, with cold treats for sale. When you purchased your Eclipse Shading Systems® products, you covered the front and back porch to have an extended outdoor living space in the backyard and to keep temperatures indoors cooler as well, which saves on energy bills during air conditioning season. 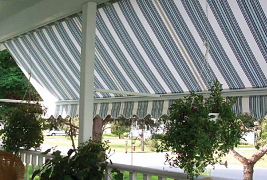 The other super fun part of choosing retractable awnings for your home was selecting the fabric. You went straight for the color, style, and function you knew you would get from Eclipse retractable awnings with brands like Sunbrella®, manufactured by Glen Raven, Incorporated, Dickson, a division of Glen Raven, and Ferrari awning fabrics, a division of Soltis Textiles. With so many different colors and designs to choose from, you really got into outdoor decorating. When you visit your Mom this summer, find her local Eclipse authorized dealership so she can upgrade her awnings! Even the ice cream truck has an awning where the customers stand so that temperatures stay cooler on that side. Well, it’s another wonderful day and here comes your daughter, home from day camp, running up to the front porch where you are waiting under the awning. “Who wants ice cream?” you ask, just like your mom did.